Kids learn numbers as they fish! 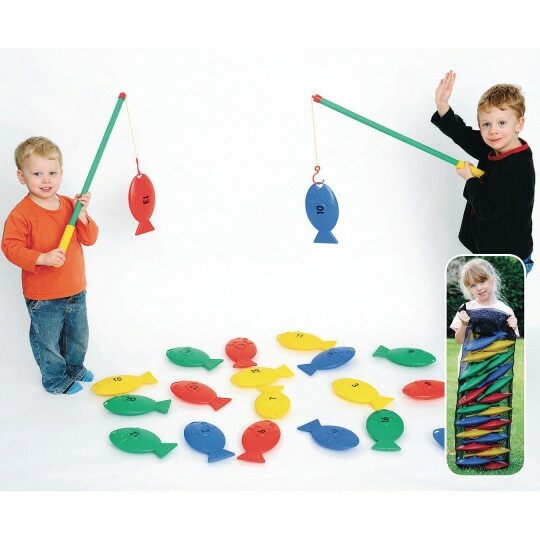 This Giant Number Fishing Game is suitable for indoor or outdoor use. Children hook the fish with their fishing rods. The game is designed to improve motor skills and hand-eye co-ordination while learning numbers 1 to 20. There are 20 brightly colored, numbered fish & 2 plastic rods, together with a net bag for storage. Fish are made from durable plastic and are approximately 23cm long and the fishing rods are 72cm long. This game can also be used in a water table.